Scarring is a common side effect of acne that occurs when the deep parts of the skin tissue become irreversibly damaged and are replaced by scar tissue. There are a number of ways to prevent or minimize scarring, and some treatment options are also available to reduce scarring. Acne is a chronic skin condition that affects an estimated 633 million people worldwide, making it the 8th most common disease globally. Acne occurs when hair follicles become clogged with dead skin cells. Common symptoms, therefore, include blackheads, whiteheads, pimples, oily skin, and scarring. The condition is most prominent on areas of the skin that contain a relatively large number of oil glands, such as the face, upper half of the chest, and the back. 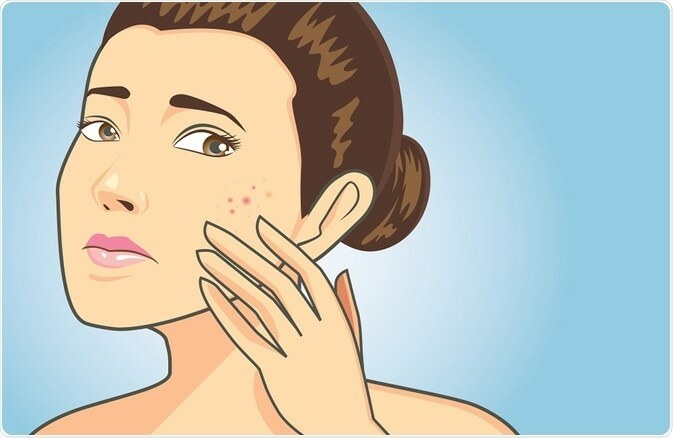 Dark spots caused by discoloration of the skin are also common in acne, but should be differentiated from scar tissue. What are the different types of scars that occur in acne? Scarring affects 95% of people with acne. Scars are formed secondary to inflammation of the dermal layer of the skin during the immune system’s response to dead skin cells. The damaged layers of the skin are subsequently replaced by fibrous scar tissue. There are two types of acne scars: hypertrophic and atrophic. They are classified based on the presence of excessive collagen accumulation or collagen loss in damaged tissue. Atrophic acne scars most commonly affect the face. They are characterized by a depressed surface of the skin that sits below the healthy skin tissue. This is caused by the loss of collagen in the skin, which subsequently reduces the skin’s ability to form healthy connections between the cells and between cells and the basal layer. Boxcar scars are wide and U-shaped with sharp edges that vary in depth, whereas ice pick scars are narrow and deep. Rolling scars have an irregular appearance and typically have rounded edges. In contrast, hypertrophic acne scars are formed when excessive collagen accumulated in the skin during scar formation. These scars are raised above the surface of the healthy surrounding skin. They are much less common than boxcar scars and usually affect the skin of the chest and the back. Although acne is determined primarily by genetic factors, the severity of acne can be controlled by modulating environmental factors. A balanced diet low in carbohydrates (simple sugars) is recommended to decrease scarring severity. To reduce inflammation, it is important to make sure that any daily skin care products used are hypoallergenic and do not cause skin irritation. For this reason, facial scrubs are generally not recommended for patients with acne. Several over-the-counted skin care products work well in reducing inflammation and skin discoloration, but the results are dependent on skin type. For example, water-based products are recommended for those with oily skin. How can acne scarring be reduced? Treatment for scarring will depend on the type of scar tissue formed. Hypertrophic scars are generally easier to treat than atrophic scars, as they do not affect the deep layers of the skin. The shallower the scar, the better it will respond to treatment. Thus, ice pick scars are the most difficult to treat. Both at-home and in-office treatment options are available for patients with acne. Acne medications all work in 1 of 4 main ways: reduce inflammation, alter hormone levels or stability, target bacteria, or target skin shedding and sebum production. Options include topical therapies using alpha hydroxy acid, azelaic acid, salicylic acid, nicotinamide, retinoids, benzoyl peroxide, and systemic therapies using keratolytic soaps, anti-androgen medications, hormonal therapy, or antibiotics. Of the above mentioned, topical retinoids, benzoyl peroxide, and antibiotic therapy are most commonly used for first-line treatment of acne. Combination therapy with multiple drug classes often produces superior results and efficacy. Some in-office procedures to manage acne include light therapy, laser therapy, dermabrasion, dermal or subcutaneous filters, and micro-needling. Limited evidence is available to support the effectiveness of these procedures for acne treatment, and response varies widely. Similarly, little evidence is available to support the use of alternative therapies such as herbal products or cupping therapy. It is important to consult a dermatologist prior to treatment to determine which approach will be the most effective for you and least likely to cause unwanted side effects. The Australian College of Dermatologists. Connolly D, Vu HL, Mariwalla K, Saedi N. Acne Scarring-Pathogenesis, Evaluation, and Treatment Options. J Clin Aesthet Dermatol. 2017;10(9):12-23. Informed Health Online. Cologne, Germany: Institute for Quality and Efficiency in Health Care (IQWiG); 2006-. Acne: Overview.